Marissa Lee Benedict, points from five shade clouds (Ivanhoe, Elysian, Upper Stone Canyon, LA Reservoir, Las Virgenes), 2018, modified zinc-plated security fencing, carbon black HDPE shade balls, molded PET plastic, water, dimensions variable. Humans no longer merely stand on the proverbial brink of impending ecological disaster; we now sit squarely in the eye of an environmental storm raging at full tilt. Sea levels are rising, inundating low-lying communities. Floating garbage islands dot the oceans. Plastic, the primary component of these drifting trash heaps, has become so ubiquitous in the environment that all animals, including ourselves, now have trace amounts of it coursing through our veins. This unnerving reality is the backdrop but not the focus of “Unthought Environments,” an exhibition that looks at the links between the quotidian (for example, dust, radios, computers) and the natural world by reconsidering basic elements such as water, earth, and air: requisites for survival that are so often overlooked. In videos, sculptures, photographs, installations, and digital imagery, the eleven participants in “Unthought Environments” eschew the big picture in favor of an in-depth look at its constituent parts. 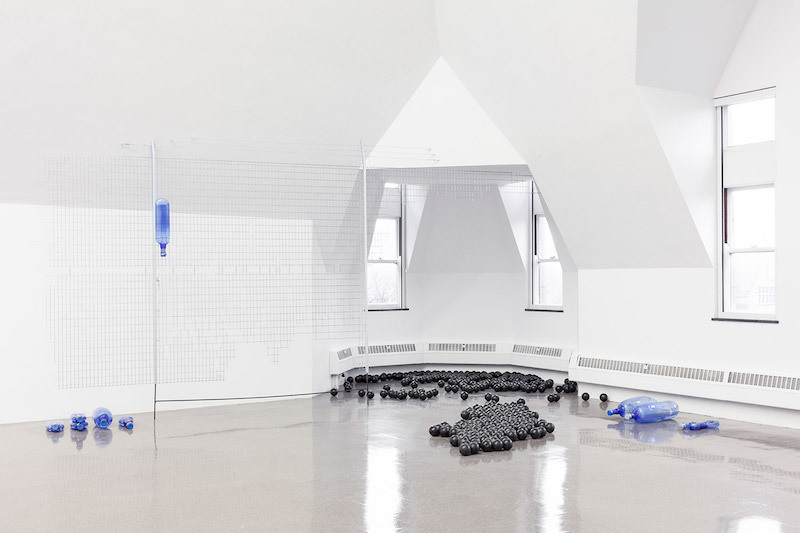 Composed of security fencing, black shade balls, and misshapen bottles, Marissa Lee Benedict’s installation points from five shade clouds (Ivanhoe, Elysian, Upper Stone Canyon, LA Reservoir, Las Virgenes), 2018, hints at pollution and the scarcity of water by examining its capture, containment, and circulation. Two collaborations between Revital Cohen and Tuur van Balen (B/NdAlTaAu, 2015, and Avant-tout, discipline, 2017) focus on the geopolitical effects of mining coltan, a rare ore, in the Democratic Republic of the Congo. Nina Canell’s Interiors (Condensed), 2013, meanwhile, traces the transformation of the omnipresent yet invisible air we breathe from a gaseous to a solid state, displaying the resultant mass inside a banal drinking glass. As an exhibition invested in the elemental building blocks of material life, it only seems just that its argument should be expressed through the irreducible materiality of the works of art in turn.